An entertaining superhero power fantasy, let down by awful Batmobile combat, a laughable villain, and serious performance issues. What is it? The final chapter of the Arkham series. Gotham is under attack, again. But while Batman is, as always, on the case, the cracks are starting to show. There’s a weariness in the world’s greatest detective this time around, as years on the job, and the pressure to find a successor, begin to take their toll. Arkham Knight is as much about a tired, aging Bruce Wayne’s struggle with himself as it is about stopping a super-villain holding his city hostage. And it’s a weariness I felt myself. 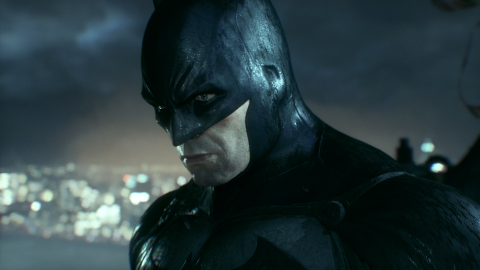 The production values are richer than ever, the city is bigger than before, and there’s more stuff to do in it, but after three Arkham games, it feels like another trip around the block. Rocksteady are fundamentally quite good at making Batman games, though, so there’s enough great stuff in here—among, admittedly, a lot of not-so-great stuff—that I made it to the end and had a mostly good time. The villain this time is Scarecrow, who’s threatening to flood Gotham with his fear toxin. A pretty by-the-numbers evil plot as far as they go, but it’s enough motivation for Bruce to pull on the cowl and go swooping into the night. Other famous heels make an appearance—Two-Face, Penguin, Firefly—but it’s the Arkham Knight, a new character, who takes centre stage. Hell, they even named the game after him. This enigmatic character commands a private army, wears a curiously Batman-shaped helmet that obscures his face, and seems to know an awful lot about the Dark Knight. Discovering his identity is the game’s central mystery, even though fans of the comics will figure it out long before Batman does. So between this mysterious new rival and Scarecrow’s toxin—not to mention dozens of other crimes that need his attention around the city—it’s another busy night for the Caped Crusader. It’s a good thing he has the Batmobile to help him this time… right? Well, no. It certainly looks cool, but the Batmobile is a failure on every level. For one, Gotham just isn’t big enough to warrant its existence. Why navigate a giant, unwieldy car through twisting streets and alleyways when you can glide to your destination in a fraction of the time? It’s not even that fun to drive, with weightless, slippy handling. I only ever used it when the game told me to, which is pretty damning. And the game forces you to use it far too often. A mystifyingly large percentage of Arkham Knight is dedicated to ponderous, boring vehicle combat, in which you use the Batmobile’s battle mode to blow up waves of conveniently unmanned tanks and flying drones. Their attacks are so obviously telegraphed, with big white lines telling you where they’re aiming—flashing red to indicate that they’re about to fire—that these sections present no meaningful challenge whatsoever. For many machines the updated port runs much better than it did four months ago. There are significant exceptions, however, especially if you're running Windows 10. For more information about the game's performance issues, see our port report. I didn’t mind them at first. They were a nice change of pace. But there are so many of them that fatigue quickly sets in. And when you start having to use stealth to take out certain heavily-armoured drones—sneaking up behind them and firing at an exposed weak spot—you wonder what was going through the developers’ heads when they designed this stuff. I’ve never felt less like Batman, and groaned whenever the Arkham Knight sent yet another wave of his dumb drones in for me to halfheartedly destroy. Stupid car aside, this is a very decent Arkham game. The predator sections, which have always been the highlight of the series for me, are more fun than ever. Hanging in the rafters and picking off enemies as they quake in fear is as brilliantly satisfying as it’s always been—and now there are even more ways to mess with them. Hacking remote-control drones to turn on their allies and replicating the Knight’s voice to order his men around are just a few of the new ways to creatively clear a room of bad guys. Batman's utility belt is fat with gadgets—some new, some old—to experiment with. Playing with these and the environment, discovering interesting ways to clear the room, is easily the best part of the game. It’s here that Rocksteady’s systemic design really shines, and Batman’s graceful, precise movement makes swinging and skulking around its complex, detailed environments a pleasure. And when stealth isn’t an option, the big-scale fist-fights are great fun too, thanks to the series’ trademark counter-based, rhythmic combat. The moment-to-moment play is tight and well-designed, which only highlights just how poor the Batmobile stuff is. Being an open-world game, there’s a lot to do outside of the main story—which, as you might expect, varies wildly in quality. There are some superb self-contained stories like hunting down a sadistic serial killer and stopping Two-Face from cleaning out Gotham’s banks. But there’s also a lot of pretty generic filler, including destroying watchtowers and clearing each of the city’s three islands of the Arkham Knight’s forces. It’s in the story where best moments and set-pieces are found. It’s a shame the Arkham Knight is such a comically bad villain. He’s horribly miscast, sounding less like an intimidating, mysterious nemesis, and more like a dumb surfer. He spends the whole game barking into your radio about how Gotham is his city now, and how you’ll never stop him, as you effortlessly destroy every single wave of useless, dopey drones he throws at you. And when you finally get the chance to fight him, about ten hours into the story, it’s a stealth tank battle. I still don’t know why they named the entire game after such a weak pantomime villain. In terms of pacing and writing quality, this is probably the least successful entry in the series so far. But I did like seeing weakness in Batman, and rare cracks in his armour. The villains’ plans are as ludicrously far-fetched as ever, but there are some surprisingly human, poignant moments in there—particularly between Batman and Barbara Gordon—that just about make up for the otherwise hoary, predictable comic book story. Sadly, though, despite Scarecrow being the main villain, the toxin-induced hallucination sequences have none of Asylum’s fourth wall-shattering brilliance. But here’s the rub. As a game, Arkham Knight is good. You’ll probably enjoy it, especially if you love Batman. But as a product, it’s a mess. Even after several patches and the embarrassment of being pulled from Steam shortly after it went on sale, it’s still running horribly for a lot of people. A significant number of players are suffering low frame-rates and hitching—even with powerful machines that are well above the recommended specs—and that can’t be ignored. With 16GB of RAM and a GTX 970, I was able to play in 1080p at a reliable 60 frames per second with most settings maxed. Except for some stuttering when the screen got really busy, I was able to enjoy the game. But because the experience varies so wildly between systems, it’s not a game I can comfortably recommend to everyone. And the inconsistent reports about its performance mean I can’t even give you a vague idea of what kind of setup will be able to run it properly. I’m glad this is Rocksteady’s last Batman game, because as much as I love the series, it’s on the brink of losing its magic. Rocksteady have done everything they possibly could with Batman—except for, perhaps, justice to the Batmobile—and this is the right time for Bruce to hang up the cowl. Ultimately, despite the feeble villain and the frustrating amount of forced Batmobile combat, the feeling of being Batman in Arkham Knight is still as wonderfully empowering as it’s been since Asylum. But none of that matters if you can’t run the damn thing.